Legos, Friends, and Petitions, Oh My! I have 3 wonderful children. They range in age from 18 to 4. All of them play (or played) with Lego. All of them share my passion for building or making things, being creative, have awesome imaginations, and are the crux of my life that I share with my wife (who incidentally is also exhibits all of those qualities as well). It comes as no surprise that each of kids is different. My oldest (a girl) grew up watching very little commercial television, disliked pink from the beginning, and was not what I would call a girly girl. She loves science fiction, inherited my nerdiness, and has a Hellboy figure standing on her desk along with Indiana Jones lego minifigs. She draws beautifully, wants to study art, dances, and loves her dog. My youngest girl is the girly girl. This was evident when she was very little. She loves pink. She wants her hair done constantly in pigtails. She dresses up constantly. She sings in the bathroom. None of which we enforced by buying any sort of “gender specific” toys. She has watched no movies she hasn’t chosen for herself, she preferred Hello Kitty over Super Heroes. There’s a theme to this. We aren’t the sort of parents to adversely influence how kids will grow up past them knowing the difference between right and wrong. We don’t watch excessive TV. I don’t force my son to play sports (although he does because he wants to). They don’t watch regular commercial TV at all. My youngest girl has never owned a Barbie. She’s had her share of dolls, an American Girl clone (mostly because American Girl Dolls are expensive). My oldest had an American Girl as well. I don’t see this as forcing them into a stereotype. I visited the American Girl store in Chicago when I was there for business. Yes, you heard that right. A male voluntarily visiting a doll store. I have 2 girls. Of course I’m going to visit a doll store, as equally as I would visit a Lego store. I see nothing wrong with the way American Girl presents their toys to a specific market. They do a good job. They promote girls and issues that girls can relate to. They teach girls history, and how women have been seen in many different times and cultures. If you are the sort of parent that doesn’t like that, don’t buy them. Same with Lego. They are just trying to make a more comprehensive toy line in a ever growing sea of competitive products. They make a great toy. One that my kids play with for hours without stopping. I can’t thank Lego enough for that, and for my 30+ years of Legos that I own (I own the complete Galaxy Explorer set!). 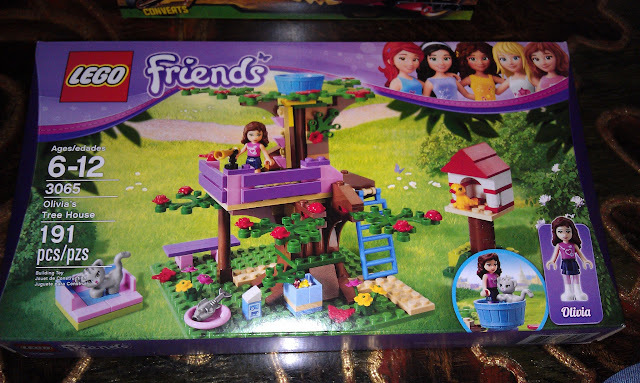 The Lego Friends collection is fantastic. I love the new sets, and am very pleased with Lego for bringing back the colors and feel of the Paradisa sets, which I missed and are now discontinued. The new minifigs are just compatible enough to work with the regular Lego minifig stuff, but different enough that my daughter can readily tell her Legos apart from my son’s (which believe me is an issue when you have siblings). The sets are still challenging to build for her (at 4) but she enjoys playing with them. I look forward to more new ones for her to enjoy, as much as I look forward to the latest Architecture set. To the parents who are petitioning the Lego Friends to be eliminated. Get off your high horse. Stop your whining about ruining the gender neutrality of Lego. You can guide your children to knowing right and wrong. You can choose what they watch on TV, but ultimately, they will become what they are destined to be and sometimes they will surprise you. But don’t blame the company for spoiling your children. That’s your responsibility as parents. You have the ultimate say in what they grow up with for values. Lego is just a company trying to compete in a free market economy, just as the company you work for that makes widgets is as well. Don’t spoil it for the rest of us who enjoy a good Lego set just because you can’t make a decision on your own about what to allow your children to play with and constantly whine about how your kids are being bombarded by popular culture and gender stereotypes. Lego Friends won’t ruin Legos just like pre-built Lego Castle wall pieces didn’t. My son builds huge structures with those wall pieces. He uses them just like he uses every brick. I’ve seen amazing stuff built with Bionicle parts. It’s all about using your imagination. They make a solid product, and I’m still using the same bricks that are 30+ years old with bricks I bought yesterday. Want to whine about pre-fab bricks, and specialty pieces? Send them to me. I’ll use them. My youngest daughter could be an engineer. She might not be. Whatever she is, I won’t look back and say: “Gee, maybe I should have not let her play with those pink Lego bricks or the girly looking minifigs…” Same goes for all my other children as well. I’ll be proud of my kids, no matter what. And I know they’ll have my values, my philosophy to live by. And that will always, ALWAYS involve Lego. No matter what color the bricks are. While this is not really a review per se, I wanted to take this opportunity to express my thanks for a great product that I enjoy everyday. I use them for many things. Notes, lists, drawings, and technical information I need to remember. I just recently was able to get back into my shop and was very pleased to find out that this summer brought an offering from Field Notes, purveyors of fine notebooks (and other goodies). They release a “colors” edition periodically that has some nifty design apart from their usual brown notebooks (which are great in their own right). I’ve bought a number of them over the past year or two, and I even tried to make it to their Chicago office while I was up there for training (alas, it was not to be as they were closed). This time around, Field Notes featured an American Tradesman Edition. It is a “corrugated-ish” blue heavy stock cover, with metallic lettering. The inside is full of graph paper. It included a special carpenters pencil and instructions on how to sharpen the pencil. I saw this pack, and had to get it. It was right up my alley, since I’m a hobbyist woodworker, and of course from time to time need to draw sketches of what I’m building. And I ALWAYS need a good pencil for measuring. I have used my Field Notes for various things in my hobby. One particular instance was building a simple water play device I found online called the Kidwash. I built in some modifications to it, and donated it to my son’s school for their summer camp and “Splash Days”. Here’s a shot of how I used the Field Notes. Field Notes helped me keep the material list straight. So I received my Field Notes American Tradesman Edition just in time for this weekend and “Shop Time” (as I call it). I had some time today to prepare the pencil as per the instructions, and get my book ready for the next project. I started by laying out everything I needed. I just used a simple razor knife to do the cutting. After starting to cut the tip on the skinny side first, I then proceeded to the wide side, and then finished the tip. Here’s a close-up. The book looks good with Teak. And it is Bob the Builder approved (yes, my wife insisted I should have Bob the Builder curtains when I first built my shop in the garage). I haven’t used the book yet, but my next project is in the planning stages, and I’ll be using my new notebook for specifically that. My son needs Lego cabinets to store our Legos, and when I say “ours” I mean 30+ years of Legos that were mine, and now his. UPDATE (7/10/11): I started the Lego cabinets this weekend, and of course, started using my Field Notes American Tradesman Edition. Here’s an overview of the project, including my Field Notes in action. If you want to see more of my work, the various project details are on this website and of course on my Picasa albums. Thanks again for a wonderful product. I really enjoy using my notebooks. I look forward to the new designs you’ll come up with.